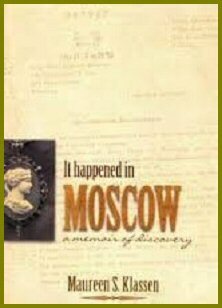 Tuesday, July 9, 2013 at 7 p.m.
"It Happened in Moscow is the riveting story of a family, a secret that spans Revolution and World War, and a stunning discovery. Maureen Klassen leads us beneath and beyond the story recounted in her earlier book, Ambassador to His People: C.F. Klassen and the Russian Mennonite Refugees, which she wrote with her husband, Herb. In this narrative, Maureen�s writing gives life to a Russian woman seeking her brother in Canada, to an intrepid man arrested by the KGB and never heard from again, and to the amazing woman at the heart of this story, her mother-in-law, Mary Brieger Klassen. This memoir attests to our human impulse to recover the truth and it demonstrates the grace to sit with the silence of the past." — Connie Braun, author, The Steppes are the Colour of Sepia.